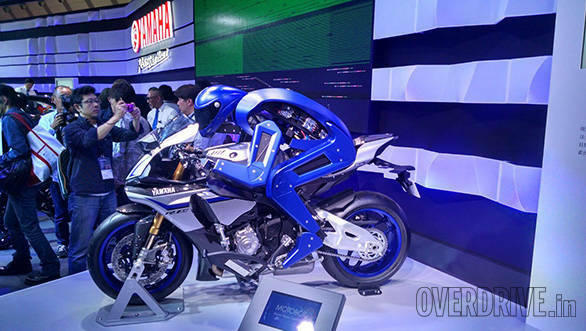 Yamaha revealed a prototype of their humanoid robot that is capable of riding a motorcycle autonomously. And no, it's not an NS-5, from the movie I, Robot, that will ride a motorcycle for us in the future but more of a rolling R&D project, built with the target of achieving 200kmph on a racetrack. Yamaha believe that studying the complex motions that are needed to control a motorcycle at high speeds will help them develop more advanced rider aids and rider safety systems and also help pioneer new lines of business in the future. Yamaha have posted a teaser video titled MotoBot Ver.1 - To The Doctor where the robot challenges Valentino Rossi to a battle, as if he didn't have enough on his plate right now. Bookmark OVERDRIVE's 2015 Tokyo Motor Show page for more updates from Tokyo Big Sight.